Real fraud protection you can count on. 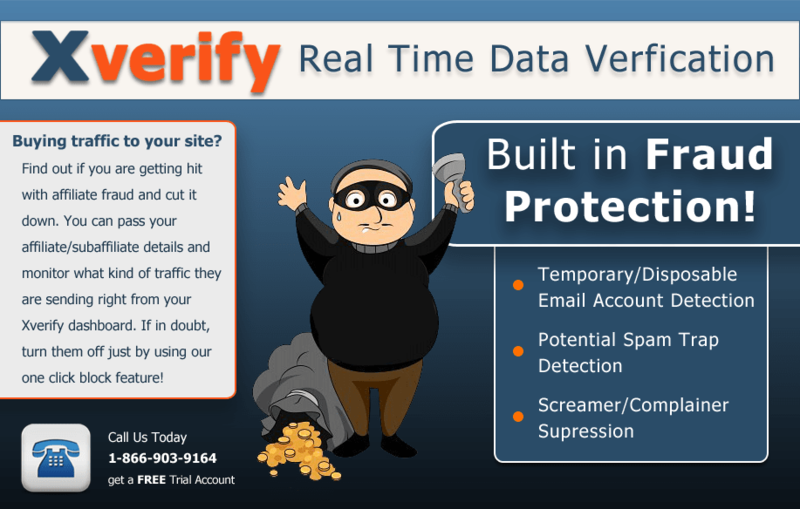 With Xverify, we don’t only check your email IDs in real time to find out if they are a real registered email account, but we also run them through our built in fraud blocking features. Temporary/Disposable Email Accounts – We know that a temporary email account could be harmful to your mailing reputation so everyday we scour the internet to look for new temporary email domains such as 10minutemails.com to add them to our master suppression file to better protect you. Potential Spam Traps – Xverify has networked with many other companies to pull together a list of potential spam traps to add to our suppression file to help you identify high risk email IDs. We understand that all it takes is one spam trap and your ability to send emails can be ruined. Every week our database of potential spam traps increases to provide you with an additional layer of protection. Screamers & Complainers – We monitor several different lists and utilize a unique algorithm to determine if a user is a screamer or complainer. These are the users that have a higher likely-hood of marking your email messages as spam. The more uses who identify your email messages as spam the less likely you will be to reach your end users inbox. 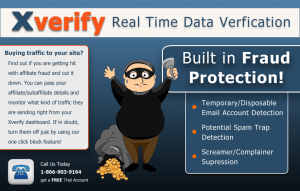 IP Verification – Are you concerned with suspicious visitors from other countries coming onto your site and creating fraud? Our IP verification can look at the geographical location of your user based on their IP address of course. If the country the user is located in, is on your allowed list they will be able to breeze right through your registration form. However, if they are not on the allowed countries list we will notify the user why they are unable to continue through your websites registration process.